This year's event commemorated the unit's 21st anniversary. It was a resounding success with over one hundred and thirty cadets & guest along with several parents and grandparents, staff & faculty and other special guests in attendance. Ms. LaSha' Rockymore, our guest speaker and a 2009 Brainerd-JROTC alumnus herself, challenged the cadets to focus and concentrate on being good followers first - 'unless you learn to be good followers, you can't be good leaders'. Her comments were inspiring and truly gave the cadets food for thought. She has her own non profit organization called Scholars Working to Achieve Greater Goals (S.W.A.G.G.) She also manages entertainers and is the Club President of a 501(c) 3 nonprofit organization, Good Neighbors, designed to activate youth in the community through entertainment. The event was held at The Mill. 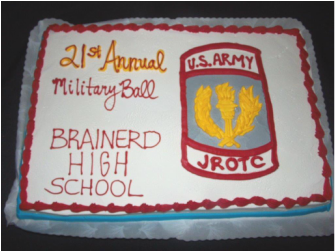 The Ball's theme was "Protectors Of Generations" Thank you for your sacrifice!!!! !